250g ( 8oz ) granulated sugar 150ml ( ¼ pint ) cold water 150ml (¼ pint ) lukewarm water 3 tbsp orange liqueur 8 thin-skinned oranges . 1- Put the sugar and measured cold water into a heavy pan and heat gently until the sugar dissolves. 3- Protect your hand by covering it with a cloth, and remove the pan from the heat. Pour measured lukewarm water into the caramel . 4- Return the pan to the heat and stir to melt the caramel. Pour the caramel into a heatproof serving dish. Leave to cool for 30 minutes. Stir in the orange liqueur. 5- Pare the zest from 1 of the oranges, using a vegetable peeler. Cut the zest into very thin strips. Cook for 1 minute in boiling water, drain, rinse thoroughly under cold running water, and set aside. 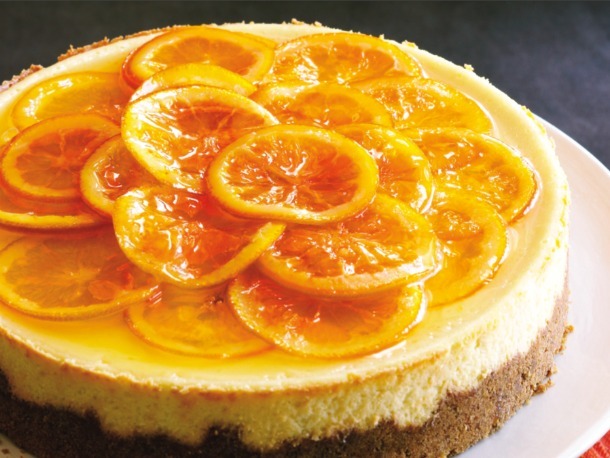 6- Using a sharp knife, remove the peel and pith from each orange, catching any juice to the caramel in the dish. Cut each orange into slices crosswise, then reassemble the oranges, holding the slices together with cocktail sticks. 7- Place the oranges in the dish of caramel and spoon the caramel over them. Scatter the strips of orange zest over the top. Chill for about 30 minutes. Remove the cocktail sticks before transferring the oranges to individual bowls to serve.